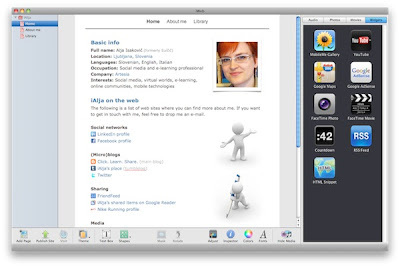 Not long after Steve Jobs announced iCloud, a free service that would replace (and, quite honestly, dramatically enhance) the existing paid MobileMe service, it was clear that those of us that were using MobileMe to host our iWeb website would have to look for a new home. Which, for me, meant looking for alternatives for hosting my online hub @ iAlja.com. Until recently, my online hub was a simple iWeb website that pointed to all my profiles around the web that I’m using actively, and had a few extra pages for an extended bio and featured work. Nothing complicated, and I liked it that way. But apparently time had come to find a new home for my online hub; a journey, which ended up on Tumblr. So, read on if you want to know why I chose Tumblr and how I’m using this micro-blogging platform as my personal website. I started my journey with relatively simple requirements. I didn’t have a lot of content, so I didn’t need a complex CMS behind the website. I could have just transferred the website to different host, but I also wanted a simple way to edit the content whenever it was needed, without having to deal with HTML files and FTP upload. So many different options… which one to choose? At first I considered transferring everything to a hosted WordPress blog and purchase extra options such as the ability to use my own domain name, customs designs etc. But that seemed like an overkill, considering that I wouldn’t be using most of the features of a system like WordPress. I already have my main blog on Blogger, and I like it just the way it is. And yes, I could have just added a few extra pages to this Blogger blog and use my domain to point directly to this blog, but I wanted to keep it as a separate place. After all, it already has several links pointing to its content (or so I like to think ;)), so I didn’t want to fix what wasn’t broken. I also didn’t want my domain to point to a profile on a social network, even though I hear it’s fashionable to direct your domain to Google+ these days. Partly because I’m not a fan of Google+ yet, but mainly because I still wanted a more unique look and more flexibility when it comes to the content, design and layout of my hub. The next option I looked at were simple to use web builders, such as Weebly or Moonfruit. 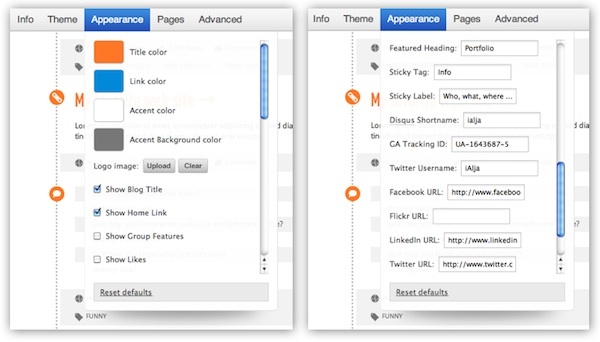 Both offer a simple web editor and the premium upgrade options for using your own domain and other goodies. I actually started recreating my old website in Weebly, but I felt the editor was a bit too limited (compared to the flexibility I was used to in iWeb), and I didn’t really like any of the templates. Then, finally, I decided to have a closer look at Tumblr, a minimalistic blogging platform that has been getting a lot of attention lately. I’ve had a Tumblr blog (ialja.tumblr.com) since January 2009 and I occasionally used it to share different types of content. I’ve always liked it because it was simple to use and allowed me to share smaller bites of content that were’t full sized blog posts, but yet I could share more in a Tumblr post than I can on Twitter. I’ve read people were using Tumblr as their personal websites, so I was curious to see what I could turn my existing Tumblr blog into. I know I could add static pages to the blog, but was there a way to make the blog look less like a blog and more like an online hub? In other words, was there a way to display some static content right on the first page without the latest post getting all the attention? As it turn out, the answer was yes. You just have to find the right theme. Tumblr has many great features that are making it increasingly popular, such as the simple, yet powerful editor for content of different types and the dashboard that makes it really easy to reshare, like and follow content posted by members of the Tumblr community. But one of my personal favorite features of Tumblr is the rich Theme Garden, which features all sorts of amazing looking themes. 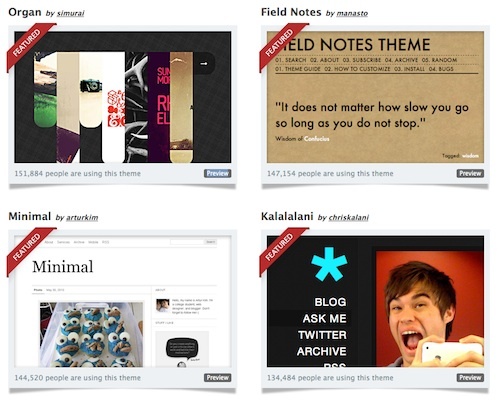 Tumblr themes aren’t just pretty to look at, but can also help you to use Tumblr for different purposes. There are themes for designers/photographers that can turn Tumblr into a portfolio, professional looking themes for business websites and much more. And here’s the best part: you can get a lot of great looking themes for free! Ok, I confess: I spent quite a few hours browsing through different themes in the Theme Garden and on different websites. I’ve never imagined I’d have so much fun playing virtual dress up with my blog! 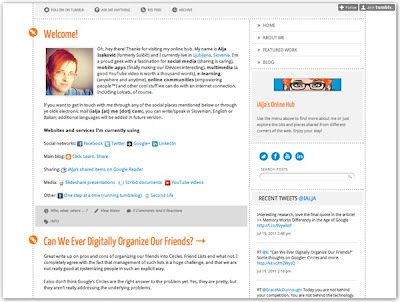 But there’s also another thing you should take into consideration when choosing your Tumblr theme: the customization and advanced options it provides. 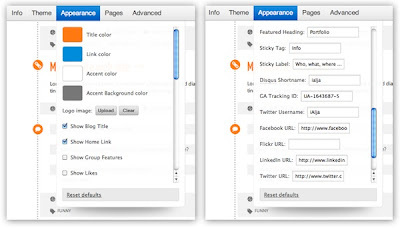 For instance, I was looking for a theme that would let me choose custom colors for links and titles, had the ability to easily add Disqus for comments, and my Google Analytics tracking ID. Yes, you can also do all that by fiddling with custom HTML, but why bother if you can find an awesome theme that does all that work for you? Well, lo and behold, at the end I ended up finding the perfect theme for just what I was looking for. It’s called Single A Theme, it’s free (! ), and provides some features that I haven’t found in any other Tumblr theme and lots of cool customization options. The key feature of this theme is certainly the ability to have a sticky post at the top of the blog - perfect for an online hub! It’s simple, it has just the colors I wanted, and it works. I’m using the sticky post feature of the theme to display an intro text with all the key links at the top, and I also use Tumblr’s Pages to display static content from my old website (About, Featured Work). In addition to that, I’ve also added a link to this blog in the menu, so it’s easily accessible from any page. The theme also allows me to display me latest tweets in the sidebar, and I can use the Tumblr blog to post quick thoughts or interesting content I come across. For longer posts, such as this one, I still use my main Blogger blog, and then just post a link to the post on the Tumblr blog. All in all, I’m really happy with this solution and with my newly discovered online home. I found Tumblr to be flexible enough, while simple to use. Yes, it might take a little while to find the perfect theme, but once it’s set up, you can just focus on posting content. It’s so simple, I even decided to open another Tumblr blog dedicated to running. The fact that it’s ok to share bite size content on Tumblr encourages me to share more, and to do it faster, without getting in the way. So, if you’re looking for a simple way of sharing content that you can make your own with a unique look, and a great community on top of that, Tumblr is definitely the way to go. Thumbs up for Tumblr!